Since the beginning of August, she's received more than $420,000 from political committees financed by a coal industry group and a secret money group out of Miami. TAILYR IRVINE | Times Democratic candidate for Florida Governor Gwen Graham speaks after Tampa Mayor Bob Buckhorn announced his endorsement at the Columbia Restaurant on Thursday, August 16, 2018 in Tampa. 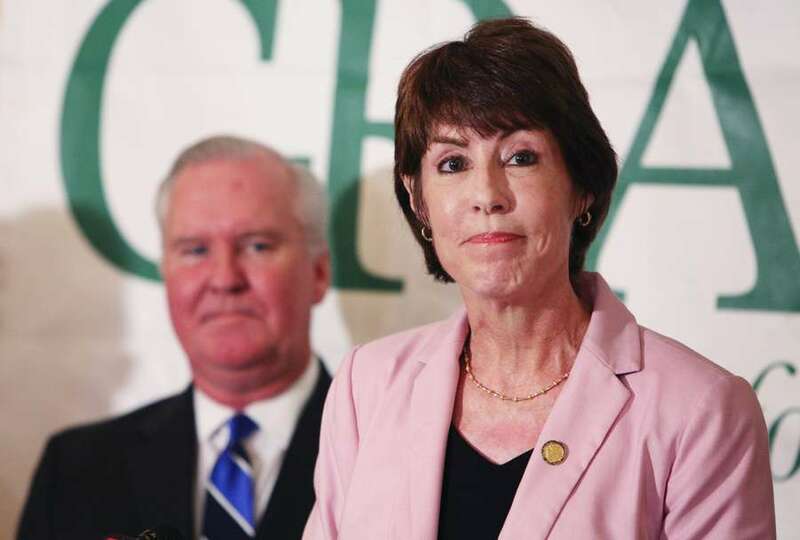 Gwen Graham has spent much of her campaign for governor criticizing one of her opponents for refusing to denounce support from a "secret money" super PAC. But over the last few weeks, she's taken hundreds of thousands of dollars from political committees with murky donors, giving her a valuable boost leading up to Tuesday's primary. A handful of political committees controlled by two lawyers have given her campaign more than $420,000 during the first two weeks of August, records show. The specific special interests giving to her is unclear, since, like many committees, the ones giving to Graham function as a pass-through for campaign contributions by other committees and corporations. But their most recent donors include Associated Industries of Florida, which has been supported by U.S. Sugar, and an Alabama organization backed by the coal industry, indicating her campaign might have received money from the groups. The shift in fundraising in the final weeks of the primary goes against much of her campaign's rhetoric over the last few months. Since May, Graham and her campaign have been hammering Tallahassee Mayor Andrew Gillum after an out-of-state super PAC started airing television ads against her. That super PAC, the Collective, has chosen not to disclose its donors. Over that time, her campaign has issued at least 22 press releases quoting 28 different supporters criticizing Gillum and the Collective. "There is no place for secret money PACs interfering in our elections," Miami Gardens Representative Barbara Watson said in a Graham campaign press release, for example. On Aug. 2, however, Graham's campaign received $31,000 from three political committees — Democratic Services Network, Florida Institute for Politics and Justice for Florida. Since then, those three committees and three others have continued to give to her, usually on the same days. But the source of the money is almost as mysterious as the "secret money" PACs she has denounced. An Alabama-based nonprofit called Jobkeeper Alliance and its committee. The organization advocates for coal interests and its press releases have blasted EPA regulations. Since June, it’s given more than $200,000 to the six PACs that have given to Graham. A Better Miami Dade, Inc., and its committee of the same name. The company has chosen not to disclose its donors. In February, it made headlines after paying for controversial robocalls in the South Miami mayoral race. Since June, it’s given more than $150,000 to the six PACs. AIF and its committees, which receives heavy funding from in-state businesses like U.S. Sugar, Florida Power & Light and Disney. Since June, it’s given $66,000 to the six committees. The six PACs have also given big to political committees managed by Christian Ulvert, the campaign manager for former Miami Beach Mayor Philip Levine, who is running neck and neck with Graham leading up to Tuesday's primary. Between May and July, the six groups have given Ulvert's committees more than $280,000. In August, their efforts appear to have shifted in Graham's favor. Ulvert did not responded to a request for comment. Graham campaign spokesman Matt Harringer said, "We have disclosed all 48,000 of our contributions — and all of the political committees referenced also disclose their donors." He added that Republicans have "weakened" campaign finance laws, and she has "consistently called out Secret Money Super PACs attacking fellow Democrats." "Gwen is one of many Florida Democrats whose campaigns have legally and properly received donations from the committees," Harringer said. "As governor, Gwen will continue to fight for campaign finance reform." The disguising of political donations by laundering them through political committees has been called "a giant shell game," allowing politicians to receive donations from special interests without the public knowing who exactly is behind the money. It makes it nearly impossible to know whether JobKeeper Alliance, for example, intended to give to Graham and Levine. It does, however, offer slightly more disclosure than the Collective, which is a federal super PAC that does not have to disclose its donors. Four of the six committees that gave to Graham are managed by Fort Lauderdale attorney Jason Blank, who declined to say whether the groups who gave to him intended to Graham. "The one thing I'll tell you is that my political committees are very active in the state of Florida," Blank said. "We are excited about the Democrats taking control of the House and the Senate." The other two committees — and the JobKeepers committee — is managed by well-known Tallahassee elections lawyer Mark Herron, who did not respond to a request for comment. Herron has worked with Graham's campaign to try to stop the Collective's ads from airing. Efforts to reach Stephen Cody, the committee chairman of A Better Miami Dade, Inc., were not successful. In February, he told the Herald that he would not disclose his donors. The number listed on JobKeeper's Facebook page went to its former executive director, Patrick Cagle, who is now president of the Alabama Coal Association. Efforts to reach JobKeeper's current leadership have not been successful. Until August, most of Graham's donors have been individuals or groups with relatively clear motives. Some of her top campaign donors, for example, have been her father, the National Education Association and Emily's List, which helps elect pro-choice women.